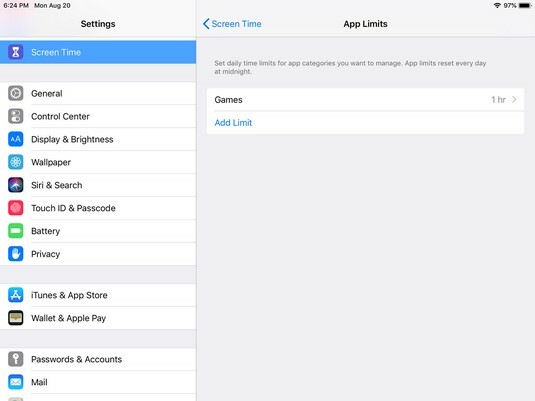 App Limits is an ingenious feature of the new iOS feature Screen Time that acts to help you curtail excessive use of iPad apps that tend to consume most of your time. Let’s face it: Sometimes we just get so engrossed in checking out social media and browsing the web on our iPads that we end up wondering where half the day went. App Limits helps remind you when the time limit is up, but does allow you to have a bit of extra time or completely ignore the limit for the day if need be. 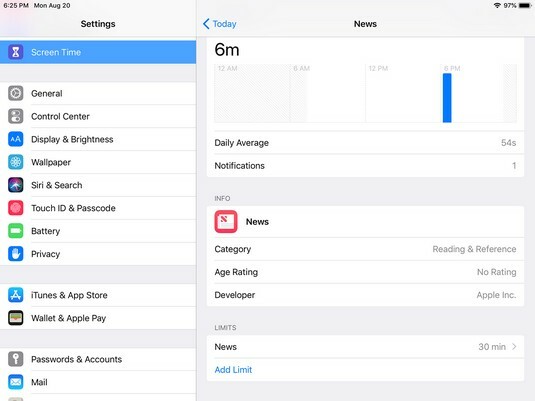 Open the Screen Time options in your iPad’s Settings app. Tap App Limits, and then tap the Add Limit button. Tap the circle to the left of a category to select it and then tap Add in the upper-right corner of the screen. 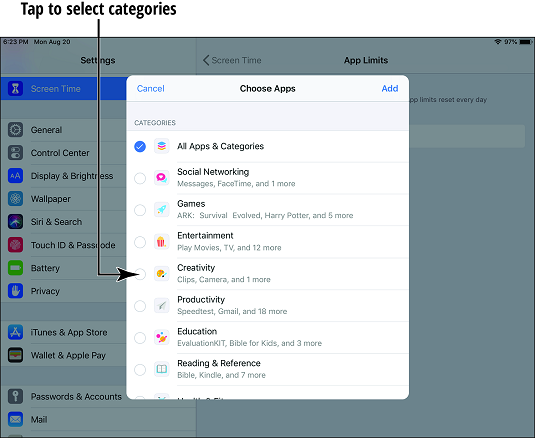 Tap All Apps & Categories to set limits for everything in one fell swoop. Use the scroll wheel to set time limits in terms of hours and minutes. Tap the App Limits button in the upper-left corner of the screen and the new limit appears in the list.Tap it to make changes to the allotted time or to delete it by tapping the red Delete Limit button, then tap Delete Limit again to confirm. 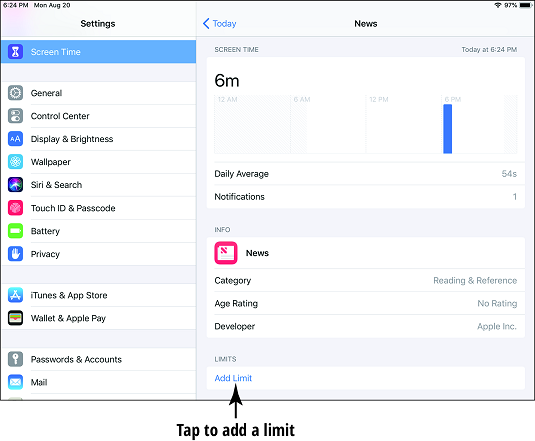 Tap Add Limit button on the App Limits screen to add more limits based on app categories, or tap the Screen Time button in the upper-left corner to exit the App Limits screen. Open Screen Time options in your iPad’s Settings app. Tap the name of your device to open the Screen Time details screen, and scroll down to the Most Used section to see a list of apps. Tap the name of the app you would like to set limits for, scroll to the bottom of the screen and tap the Add Limit button. Tap the Add button in the upper-right corner of the screen and the new limit appears in the Limits list at the bottom of the screen. Tap it to make changes to the allotted time.To delete a limit, tap it, tap the red Delete Limit button, and then tap Delete Limit again to confirm. Tap the Back button in the upper-left corner to exit the apps screen. 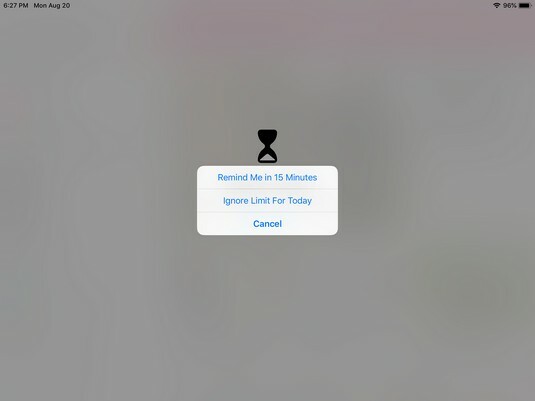 Your iPad will notify you when you’ve reached an app’s limit: the screen will become gray, displaying an hourglass, and the app’s icon is also grayed out on the Home screen where it resides. If you’d like more time, tap the blue Ignore Limit button in the center of the screen, and then tap Remind Me in 15 Minutes or Ignore Limit For Today. Tap Cancel if you’d like to adhere to the limit you’ve set for the app. If you enabled a passcode for your iPad’s Screen Time feature, you must enter it before overriding the app’s time limit. 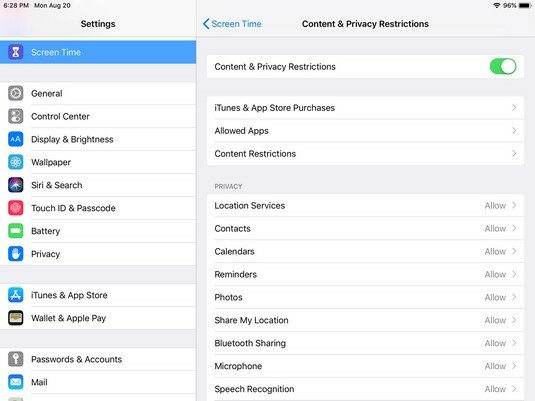 Screen Time helps you prevent access to content that you don’t want to be accessed on your iPad, and you can also use it to set privacy limits. Content to be restricted could be apps, websites, media (movies, music, etc. ), books, and more. If you’re going to restrict content and set privacy restrictions, it’s advisable to enable the Screen Time passcode on your iPad. That way, only someone knowledgeable of the passcode can alter the settings you’re about to make. This is highly recommended, especially if you’re original intent is to provide safety for any children who may use your iPad. Tap Content & Privacy Restrictions and then toggle the Content & Privacy Restrictions switch to On (green). Tap iTunes & App Store Purchases to allow or block installation of apps, deletion of apps, or in-app purchases (purchases that may occur within an app, such as buying upgrades for characters in games).Also decide whether users always require a password when making purchases in the iTunes Store or App Store (It’s highly recommended that you use this option if other people use your iPad). 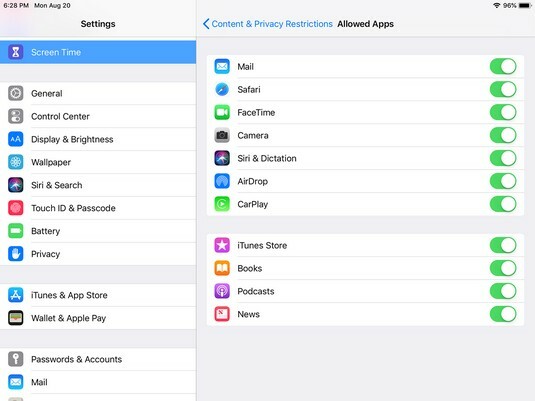 Tap the Back button in the upper-left to return to the Content & Privacy Restrictions screen, and then tap Allowed Apps.This feature allows you to enable or disable apps that are created by Apple and are installed on your iPad by default. All of them are enabled to start. If you’d like to disable any of them, simply tap the switch to turn it Off (white). This will completely remove the app from the Home Screen; re-enabling the app will place it back on the Home Screen. Tap the Back button in the upper-left to return to the Content & Privacy Restrictions screen, and then tap Content Restrictions. In the Allowed Store Content section, you can make restrictions based on certain criteria.For example, you can limit which movies are available for purchase or rent in the iTunes Store based on their ratings. The Web Content section lets you restrict access to websites.From there you’re able to allow unrestricted access to the web, limit access to adult websites, and further limit access to only a list of specific websites that you can customize. You may remove sites from the list by dragging their names to the left and tapping the red Delete button that appears. You may add websites to the list by tapping the blue Add website button at the bottom of the list. Options in the Siri and Game Center sections let you prevent access to untoward content or language, as well as disabling multiplayer games, adding friends to games, and turning off the ability to record your iPad’s screen. 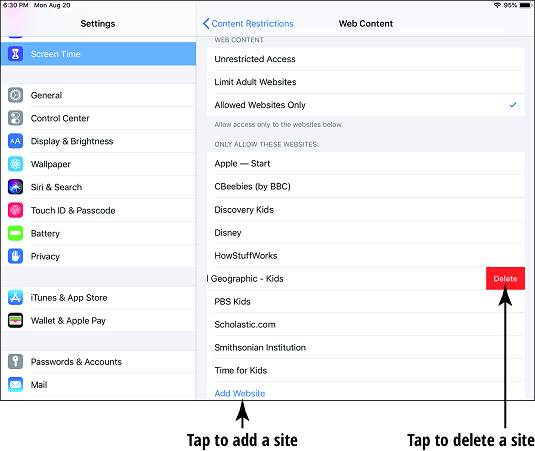 Tap the Back button in the upper-left to return to the Content & Privacy Restrictions screen, and then view the items listed in the Privacy section.This area lists features and functions built-in to your iPad. Tapping one shows you which apps are accessing the feature or function, enabling you to limit access to specific apps or to turn off access to them altogether (by selecting Don’t Allow Changes). 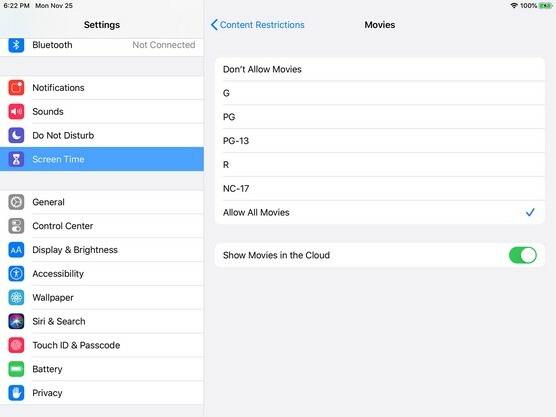 Finally, the Allow Changes section of the Content & Privacy Restrictions screen lets you determine whether changes may be made to such features of your iPad such as Volume Limit settings, Cellular Data options, and more. Apple has provided some privacy settings for Safari that you should consider using. Tap the Show/Hide Tabs button. Tap Private in the upper-right corner; you’re now in Private Browsing Mode. Tap the Private button in the upper-right corner again to disable Private Browsing.